New wireless EV charging system integrated by Ricardo – Qualcomm Halo™ technology – will bring new level of convenience to the one-seater electric vehicle. To enable future mobility based services in a planned autonomous version of Electra Meccanica’s SOLO electric vehicle (EV), the Canadian-based designer and manufacturer of EVs contracted the Hybrid and Electronic Systems team at the Ricardo Santa Clara Technical Center, to integrate the SOLO with a wireless EV charging (WEVC) system from Qualcomm. Qualcomm Halo™ WEVC technology uses resonant magnetic induction to transfer energy wirelessly from a ground-based pad to a second pad integrated within the vehicle. This energy is then used to recharge the vehicle’s battery and no user interaction with infrastructure or cables will be required. Electra Meccanica is currently developing its SOLO single passenger all-electric vehicle which is intended to revolutionize the way people commute. 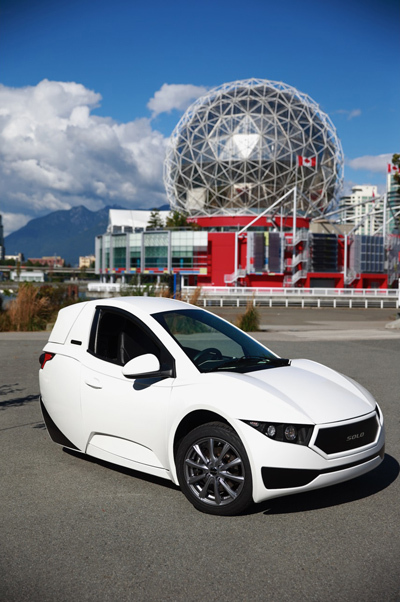 SOLO is a three-wheeled, highway capable commuter car with a 100-mile range provided by its 17.3 kWh Li-ion battery pack. Currently, recharging is by wire via a J1772 Universal Connector using a standard North American 110V or 220V AC electrical supply. Qualcomm Halo WEVC technology has a high misalignment tolerance, both vertically and horizontally, enabling it to support high and low road clearance vehicles such as SUVs and roadsters, with the ground-based pad installed either on the road, flush mounted or even buried beneath the surface. The car does not need to be precisely parked; proper alignment of the charging pads is conveniently indicated through a positioning system. This technology has the potential to revolutionise the electric and plug-in hybrid vehicle ownership experience and remove the inconvenience of plugging and unplugging almost every day. Ricardo worked with Electra Meccanica to prepare a Qualcomm Halo WEVC demonstration system for integration. This was tested at the Ricardo Santa Clara facility before integration into the SOLO technology demonstrator vehicle at Electra Meccanica’s facilities outside of Vancouver. The application software development and testing of the vehicle was completed in January 2018 and the vehicle is ready for investors and customers to experience the improved functionality the system offers the SOLO, freeing users from the need to plug and unplug.